In this article, I describe how to access the Plantronics Manager Pro APIs for real-time events. The source code is pointing at the "Sandbox" tenant. However, once you have access to your own tenant you will just change the relavent URLs and security tokens (the tenant information provided during Hub install and generating a PubNub channel to receive your realtime events). This example is written in C#, but there are many other languages supporting PubNub. These real-time events are received as JSON and are suitable for integration with custom applications that need real-time status of your UC platform. This sample implements a basic event reciever to illustrates the simple logging of the received JSON on the console. The below diagram shows how a partner solution is able to connect to the Open Data Access Streaming API and receive the realtime events from the Plantronics Manager Pro cloud platform. Each Plantronics Manager Pro tenant that has Open Data Access enabled can optionally push various realtime events to a tenant-specific PubNub channel. You can then develop apps that listen to that PubNub channel and consume the realtime events. Below is the sample code C# code that defines the tenant's GitHub keys in the App.config file (Subscribe Key, Publish Key and Subscribe Channel). 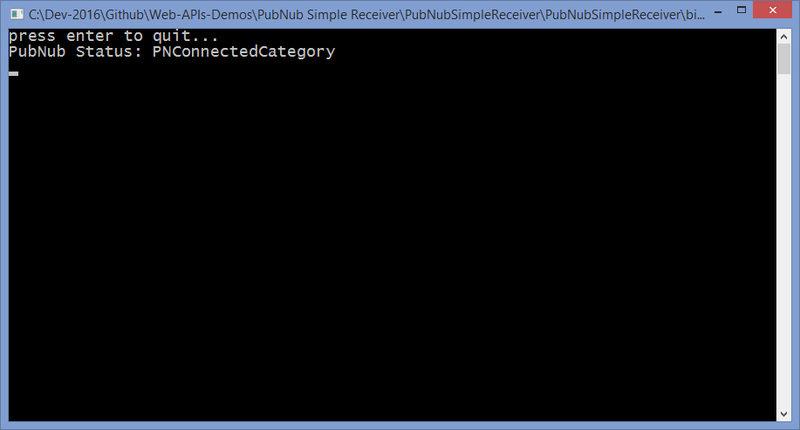 It uses the NuGet package called PubNub to connect to the PubNub channel. The code then defines a callback to handle messages received (with pubnub.AddListener), that just displays the message contents to the console. It also adds a handler for the PubNub status messages, so you can see if it was connected successfully, etc. /// to receive headset events such as QD (quick disconnect) connected/disconnected and Mute (muted/unmuted). The below screenshot shows the application running and awaiting realtime events from the sandbox tenant.